It's everybody's favorite time of the year. Time to wind down with your friends and family and enjoy all that the holiday season has to offer. For a lot of us that includes the end of year office Christmas party. 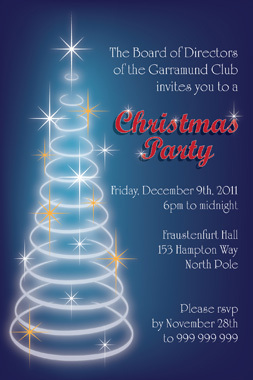 Enter the perfect printable invitation design for your company's work do or office Christmas Party. A lovely deep blue background features a glowing Christmas tree decorated with silver and gold stars. The invitation wording falls along the right side of the tree with room for your business name, date, party location and rsvp details The words "Christmas Party" are highlighted in a bold red font that stands out against the contrasting backdrop. The wording can be customised for your Christmas party and there is space for some additional information. The background color can also be changed if required. Of course this design is not restricted for use only as an office party invite. you can use this design for you a Christmas party that you are throwing in your home for your family and friends, or any other group get together that you are planning a party for. It works well for like Play groups, mothers groups, school and day care break ups, hobby clubs, sports teams too. This invitation design is only available as a "print it yourself" 4"x6" or 5"x7" jpeg file.